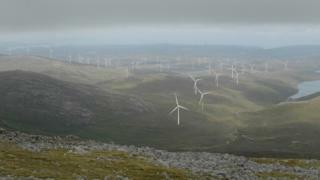 Chaidh pròiseact airson 45 crainn-ghaoithe a reic ri Lewis Wind Power (LWP) - co-bhanntachd eadar an dà chompanaidh chumhachd Amec Foster Wheeler agus EDF Energy Renewables. Fhuair Tuath-gaoithe Uiseinis air Oighreachd Ìsginn ann an ceann a deas nan Loch ann an Leòdhas cead-dealbhachaidh ann an 2010. 'S ann le LWP a tha planaichean Tuath-gaoithe Steòrnabhaigh anns am bi 36 crainn-ghaoithe an iar air Steòrnabhagh. Thathar an dòchas gun cuir seo ris an argamaid 'son càball dealain ùr a chur eadar Tìr-Mòr agus Leòdhas. Cha deach innse dè a phàigh LWP airson Tuath-gaoithe Uiseinis. Eadar an dà sgeama bhiodh comas aig na crainn-ghaoithe 342MW de chumachd a chruthachadh. Thathas a' dèanamh dheth gum feum pròiseactan a chruthaicheas còrr is 350MW a bhith air an gealltainn mus tèid an càball mara air adhart. Tha LWP den bheachd gu bheil an dà phòiseact aca-san cudromach san argamaid an càball fhaighinn. Thuirt a' cho-bhanntachd gum faigheadh an sgìre buannachd à Tuath-gaoithe Uisneinis leis gum biodh cothrom aig Comhairle nan Eilean Siar earrannan den sgeama a cheannach agus na prothaidean a chleachdadh airson maith na coimhearsnachd. Thuirt Ceannard Comhairle nan Eilean Siar, Aonghas Caimbeul, gur e cothrom air leth a tha seo 'son am pròiseact a chur an sàs. "Thig buannachdan às an seo dhan choimhearsnachd ionadail, agus dha na h-Eileanan an Iar san fharsaingeachd, leis gum bi cothrom aig a' Chomhairle cuibhreann math den sgeama a cheannach. "Tha sinn a' cur fàilte air an naidheachd agus cuiridh e ris an argamaid càball-mara a chur an sàs," thuirt Mgr Caimbeul. Thuirt Nick Oppenheim, bho Ìsginn Earranta agus leis a bheil an làrach far an tèid Tuath-gaoithe Uiseinis a thogail, gu bheil e air a dhòigh gu bheil LWP a' dol a thoirt na sgeama air adhart. Dh'innis Ìsginn Earranta air a' mhìos a chaidh gun robh iad airson sgeama haidro a thogail air an oighreachd. Tha dùil gun tèid cead a shireadh airson sin nas fhaide air a' bhliadhna.